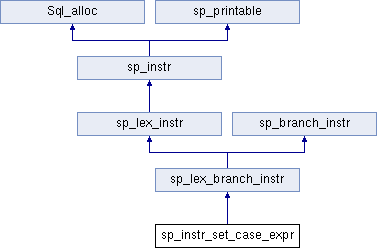 sp_instr_set_case_expr is used in the "simple CASE" implementation to evaluate and store the CASE-expression in the runtime context. Update all instruction with the given label in the backpatch list to the specified instruction pointer. Execute core function of instruction after all preparations (e.g. setting of proper LEX, saving part of the thread context). Callback function which is called after the statement query string is successfully parsed, and the thread context has not been switched to the outer context. The thread context contains new LEX-object corresponding to the parsed query string. Mark this instruction as reachable during optimization and return the index to the next instruction. Jump instruction will add their destination to the leads list. Inform the instruction that it has been moved during optimization. Most instructions will simply update its index, but jump instructions must also take care of their destination pointers. Forward jumps get pushed to the backpatch list 'ibp'. Update the destination; used by the SP-instruction-optimizer. old_dest current (old) destination (instruction pointer). new_dest new destination (instruction pointer).